Director of Personnel and Labor Relations Ray Burney on Wednesday gives Common Council Personnel Committee members an update on the recent City reorganization. NORWALK, Conn. – City officials will soon hold interviews to fill key top Norwalk administrative positions, Director of Personnel and Labor Relations Ray Burney said Wednesday. 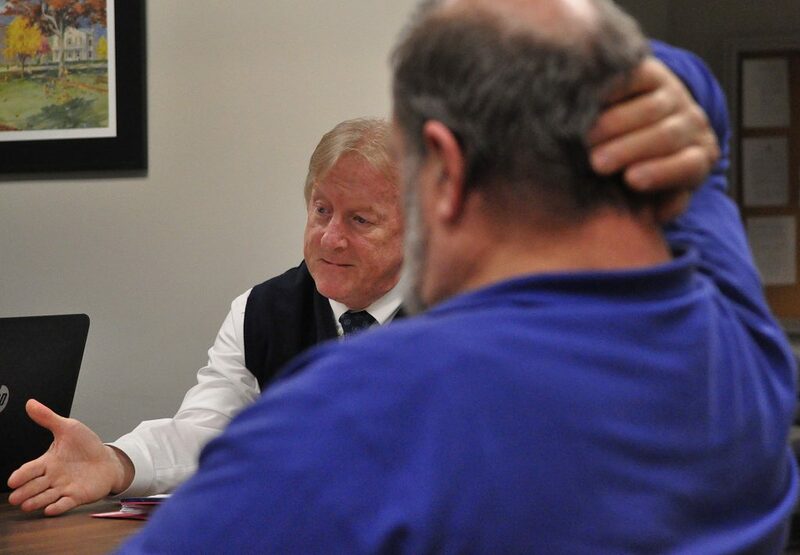 Until those hires are made – and gain some experience – it’s impossible to evaluate the effectiveness of the reorganization of the City governmental structure, Burney said to the Common Council Personnel Committee. Burney’s update also included mention of reorganizing City Hall office locations. Minority Leader Doug Hempstead (R-District D) suggested that the building needs updating and other Council members indicated agreement. The reorg requested by Mayor Harry Rilling was approved by the Council in April, creating two new department head positions, and a chief of staff. Then-Assistant to the Mayor Laoise King took on new responsibilities and the title of Chief of Staff, which Rilling said was more appropriate to her existing role. The changes were a “realignment of city resources and employees into a more rational and efficient organizational structure that represents the needs and functions of a modern city,” according to a handout from Burney. There’s been no movement on creating the contemplated Chief of Community Services position, Burney said Wednesday. That change was delayed after the Norwalk Branch NAACP objected to merging the Fair Rent, Fair Housing and Human Relations director position with the Human Relations & Fair Rent Department Director position. Burney told Council members Wednesday that he wasn’t sure what the timing would be on creating the Chief of Community Services position and would ask Rilling and King and get back to them. The only new position that has been filled is the Chief of Economic and Community Development, he pointed out: Jessica Casey has been in the role for 15 days and is getting her feet wet, he said. The City was set to hire a good candidate for Chief of Operations and Public Works in November but he “decided to take job in private sector and make some money,” Burney said. Hempstead asked if the salary is the issue. “We think in our discussion with the candidates in October-November, that didn’t seem to be the hurdle,” Burney said. He explained that the job could pay $160,000 a year but he expects it to be closer to $155,000. He took the job listing down for the holidays but it’s back up now and new candidates will probably be interviewed in early February, he said. Department of Public Works Director Bruce Chimento retired in September. DPW Principal Engineer Lisa Burns and DPW Superintendent of Operations Chris Torre are sharing the director’s responsibilities, according to Burney. Ken Hughes has filled the Superintendent of Recreation job and is performing some of the director’s budgeting responsibilities until that slot is filled, Burney said. He added that the City decided not to hire a Superintendent of Public Property and Parks until a director is found. There are good candidates for a new director and interviews will be held this month, he said. The Transportation, Mobility and Parking Department, which is under the Chief of Economic and Community Development, has been created and is being led by Kathryn Hebert, formerly Administrative Services Manager, Burney said. Three finalists for transportation planner, a new Planning and Zoning position, were interviewed and the top candidate will be interviewed by Planning and Zoning Director Steven Kleppin, Burney said. He noted that the new hire will work closely with Hebert. Much of what’s being done “behind the scenes” is driven by the budgetary process, with paperwork to reconfigure departments positions “reporting-wise in the budget structure to conform with what was approved,” he said. Burney said that the location of some City Hall offices could also change. He noted the awkward location of the customer service department, on the second floor and down a hallway, next to the Department of Public Works. The Personnel Department, which is on the first floor, may move so that the Chief of Economic and Community Development could be next to the Code Enforcement Department, and maybe the Transportation, Mobility and Parking Department would be in the space now used by Recreation and Parks, down the same hallway, he said. “This is not the mid-80s. Things change,” Hempstead said, referring to the work done 30 years ago to transform the former Norwalk High School into City Hall. Fair Rent might move across the hall, Burney said. “You literally have to lay out the whole building and look at your space,” Personnel Committee Chairwoman Barbara Smyth (D-At Large) observed. Building and Facilities Manager Alan Lo and King are working on it, Burney said — in his opinion, no one disagrees with Hempstead. “Long term, after 30 years, is it time to take a look at the way the building is laid out and bring it up to date? I know it’s very expensive but at the same time,” Hempstead said. There’s been on grievance filed due to the reorg, from a person in Recreation and Parks, “that has not gone beyond anything other than the filing of a grievance and a discussion,” Burney said, in response to an inquiry from Hempstead. Council Finance Committee Chairman Greg Burnett (D-At Large) asked when the Council would be able to measure the effectiveness of the reorganization. Until those roles are filled and the new hires get “a little bit of the lay of land,” a diagnosis of the issues isn’t possible, he opined. Why not move the Board of Ed to the currently unoccupied Briggs building? That would make room in City Hall to locate the groups in each department near each other. Does anyone really believe the Mayor’s Reorg will save taxpayers major sums ? Or enhance the City’s disheartening governance reputation with the business community ? But it does salt City Hall with $150k Chiefs paid far above what they could earn in the privat sector. And encourages City Unions to ask for major raises in salaries/benefits. Evidence is mounting that a background as a former Police Chief isn’t sufficient to effectively manage a City with nearly 90,000 residents and a $350 million budget. @ Nancy There would seem to be other offices/departments currently housed @ City Hall that might be possible candidates for relocation off-site including Redevelopment Agency & Probate Court which like a few others are not (I believe) part of “official” City government or the BOE. As square footage becomes needed for other purposes, makes me wonder if these entities contribute towards sf cost of operation. Having BOE co-located with other City government functions seems to have worked well in terms of communication, collaboration, efficiency, since the move to 125 East Ave. I have confidence that those looking into the space needs issues will take all these things and more into consideration as they explore options. Stunning. First a reorganization that anybody in a corporate cubicle could have designed from their desktop–disconnected from any measurable goals in savings or service. Here are some numbers related to one of the positions that WAS filled. Thirty (30) days ago, over three hundred citizens signed and delivered a petition protesting the plan to charge for the parking at Liberty Square, an on-street common parking area that contains about 60 spaces. According to the draft POCD, NPA manages over 4,000 spaces. I note that the cabinet-level transportation, mobility and parking position is already filled and filled by a long-time employee who does not need time to get up to speed. Despite the nebulous goals of increased accountability in transportation, mobility and parking the parking authority avoided informing residents of the specifics of the charges in that lot up until the very day they voted on it. Residents opposed to the idea attended THREE consecutive parking authority meetings, and two public forums on parking all without being told the specifics of the charges for the lot. Despite the fact that this petition went to 30 city officials and employees on three governing bodies, by print and by email, including the cabinet-level transportation, mobility and parking employee, only ONE person acknowledged the petition. To date, ZERO out of three of those bodies have deigned to put it on an agenda for the public to observe their acknowledgement and discussion of the petition, and we are FIFTEEN days from the date this plan goes live. The ONE individual was a member of the BET, and NOT the Mayor. The Mayor’s public comments on the issue indicate that he consulted NOT with the new cabinet-level transportation, mobility and parking employee, but instead spoke to the Chair of the NPA, who has CORRECTLY AND PROPERLY RECUSED himself from this issue from DAY ONE, because of a conflict of interest. This conversation is illustrative of another Norwalk “management” problem. Failing to plan, and ignoring the plan. Fun fact: From the article, it appears a discussion is now taking place about rearranging the physical operation of City Hall, and possible capital improvements to the building. This does NOT appear anywhere in the current draft POCD as a recommendation that needs examination in the next ten years. Despite the fact that multiple council members, commission members and the Mayor attended interview sessions and public forums going back to the summer of 2017, this concept did make the final cut in a 190 page draft POCD recommendation. I know my table at the November 2017 Kickoff POCD Citywide Forum put this very recommendation on our map/recommendation that was taken by Stantec, which means the public recognized this issue two years ago. You know where this recommendation DOES appear? The 2008 POCD. Under D.2. Public Buildings: D.2.1.5 Improve all public facilities to maximize their efficiency and effectiveness and to minimize the need for capital expansion. You know what we HAVEN’T done in the last TEN years when that WAS part of the plan? Rearrange City Hall to improve it to maximize its efficiency and effectiveness and to minimize the need for capital expansion. But they did “reorganize” the org chart and literally hand out raises to everyone in the building. And they did eyeball taking away part of the (used daily) track to make room for more parking. Parking being something that folks living near the train stations in East Norwalk and South Norwalk are told they need less of. All references to ‘sustainability’ in this draft POCD are in the context of environmental sustainability and not operational or budgetary sustainability. investment of more than $140 million through 2012.
or repair, while others have become obsolete and are no longer needed. And nobody has questioned the goal of moving Norwalk from a bottom thirty ranking (an alliance district) to the TOP spot in TEN YEARS. Sustainable? I think not. UNLESS we figure out the implementation plan that is going to get our tax base in line with our aggressive goals and spending, AND THEN NOT HAVE DEPARTMENT HEADS AND COMMON COUNCIL MEMBERS run off proposing things that are NOT IN THE PLAN. Here’s a recommendation that also did not make the current draft POCD. Provide for ongoing maintenance and efficiency in usage of the City’s various fleets of vehicles. This, despite the fact that the last POCD lacked this reference to a basic capital requirement of any municipality with transit, police, fire, parks and DPW vehicles (not to mention cars issued to certain members of the Mayor’s office), and department heads had to use a MADE UP POCD code on their capital budget requests. The new draft POCD does recommend converting the fleet to electric or hybrid vehicles (try that with a fire truck or police vehicle or snow plow), but it does NOT recommend supporting an existing capital replacement plan (does one exist?) or a new one that must be followed to achieve the overall goals for management of the City. And it does not recommend looking for efficiencies between departments in the use of the ones it has. Back to City Hall and Parking: Fleet vehicles take up valuable spaces at City Hall, making it difficult for citizens to park there. I’d imagine most of the employees park there as well. Have we considered moving the fleet to an off-site lot, and having employees shuttle over when they need these (largely idle) vehicles? Have we considered doing the same for employee’s personal vehicles that they use to go to and from work? Here’s a challenge for the City Hall folks who are foisting decreased parking on us over in East Norwalk because of the train station. It’s even easier than the TIDE POD challenge. Have out of town employees take the train to East Norwalk station and use the Wheels4U bus for an entire month, instead of driving directly to City Hall in their cars. Have in-town employees use the Wheels4U option exclusively to get to work. If using the public transit option is now a requirement for us TOD district denizens to get to work, it should be good enough for City employees too! Burney seems like a good guy. Reminds me of typical HR – lots of words, but no meaning. Fluffy CYA stuff. Mr. Burney’s handout lists “the reorg’s goals as increased accountability and improved operational performance”. @Deb Goldstein, what a perfect example. This city has a fetish for mediocrity. Did I read this correctly? Moving able bodied city employees (who can walk and more or less move themselves) and desks around under one roof and switching them up in different rooms and locations under one roof (and I stress UNDER ONE ROOF!) is never cheap? Is City Hall a castle, and its employees royal subjects of most high maintenance, who require a substantial taxpayer fueled moving budget to shuffle them around? Please don’t spend MY money on this baloney! I would bet, if planned methodically, relocating everybody under one roof could take place in several week’s time, no more than a month conservatively, and for not much money at all. Generate a blueprint as to where each department should be allocated and start gradually moving departments as soon as next week. Decide on a final deadline. Why always excuses and high drama and high expense? In the time that Mr. Burney talks about how long this moving will take, a first draft of the department relocation blueprint could have been completed and approved. City Hall, less stalling and more action. Does this mean they passed this entire reorganization WITHOUT a diagnosis of the issues? Am I missing something? Please explain. It is confusing, Paul Persius. Yes, City Hall/Common Council did pass this entire imaginary reorganization, and our second Mayor King (Love when both mayors show up at one specific meeting, but neither one of the two mayors show up at another important meeting…), without a diagnosis of the issues. Another signature, lacking in transparency, closed session, cart before the horse style production for the tax paying stakeholders to scratch their heads over, compliments of Norwalk City Hall. Surprise! The plan is there is no plan, as is made clear by the numerous cop outs and excuses made by Mr. Burney in this coverage. Aside from looking just really, really bad, it is infuriating in its frivolity. New management, Please! Norwalk deserves excellence. No. Norwalk does not deserve excellence. An electorate that doesnt know whats happening and mostly doesn’t even vote deserves excellent GARBAGE and that’s what we get. Good point, Hugh Sling, and point taken! Vote, Norwalk! How is it that our city has so many “chiefs” and other officials making salaries equivalent to the governor of Connecticut?! Mayor Rilling’s so called “Reorg Plan” better reflects how Norwalk is really mismanaged than the Mayor could have possibly imagined. Homeowners know we’ve passed the Rubicorn. Housing values will continue to fall as longtime homeowners see the inevitable. The Mayor’s “Reorg Plan” is just another peg. Exactly, Jo Bennet. How is that? And mind you, salaries in this range for folks who are not even subjected to comprehensive annual performance evaluations. And they get annual baked in raises each year whether they deserve them or not. Someone mentioned here in a post that a city employee who quite literally mans a desk most of the day earns into the six figures while the employee’s counterpart makes half or less that salary to do the same job. So, even non chiefs/bosses are earning bloated salaries. I wonder how many employees are? Like Mr. Burney states in this coverage, goals of the “restructuring” are working on increased accountability and improved operational performance in several areas. Working on? And Norwalk’s Common Council green lighted this? Last time I checked, the goal of a “restructuring” is not to work on accomplishing what should be accomplished accountably and competently on a daily/weekly/monthly/annual basis (aka, doing your flippin’ job!!!) with a comprehensive annual evaluation to reinforce that the aforementioned is being accomplished. Would be interesting to see a complete list of the “fat” Norwalk City Hall Chief and Boss salaries and raises from year to year, itemized alongside the redundant overlap job descriptions of some individuals. Would be an eye opener for taxpayers.